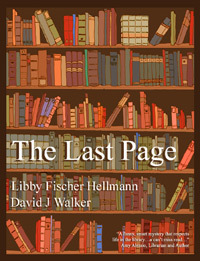 The Last Page, a novella I co-wrote with fellow Chicago mystery writer Libby Fischer Hellmann, is now available on Kindle, NOOKbook, and lots of other eBook formats. Libby's a talented writer and it was great fun to collaborate on the project. It's a mystery story (naturally) and at about 20,000 words it's about 20% or 25% as long as an average mystery novel. It's more of a "cozy" than anything else I've produced, and it all takes place in and around the library in a fictional town along Chicago's North Shore. "It is nice to see such a funny, smart mystery that respects and features what real life is like in the library. While we don't save quite as many records as Director Barbara, we do often have good memories. The staff, especially the maintenance man JJ (no periods), is right on target. The seamless combination of Hellmann and Walker's skillful writing makes this a can't miss read." It's a great, fast read! So get out your eReader and order The Last Page. Oh, and then review it on Amazon or Barnes & Noble online... or anywhere else.